A very brief history of timber-framed buildings. 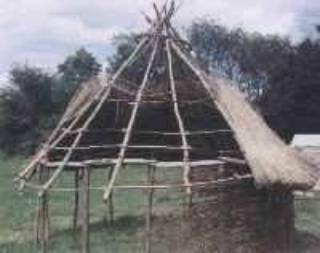 Early timber framed buildings, based on post-hole construction, were widespread and the most common type was the roundhouse in which many Iron Age people lived. The main timbers of a roundhouse would have smaller, coppiced timber, such as hazel, woven in between the rafters and posts to make the structure more rigid. The walls were then plastered with a mixture of cow dung, straw and mud, which provided a sound walling material, after it had dried to a hard consistency. The roofs would have been weathered with either a layer of turf or thatched with straw. Buildings based on post-hole construction are still used today, as many farms still have pole barns, which are often built from second-hand telegraph poles. These poles were originally heavily creosoted and will last for many years. When the Romans invaded Britain they brought with them far more advanced construction techniques than we had known. Their jointing of timber was much more sophisticated than ours and included triangulated roof trusses and mortise and tenon joints. When the Roman influence diminished in the early part of the fifth century these advanced construction techniques seem to have been lost. During the rule of the Saxons and the Vikings, construction methods were very basic, they used simple jointing methods, reverting back to the post-hole system. 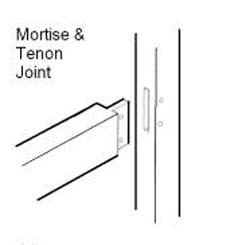 It was not until the 12th century that mortise and tenon joints reappeared, during the rule of the Plantagenet’s. (The Plantagenet dynasty, founded by Henry II of the French House of Anjou, seized the English throne in 1154 and ruled England until the accession of Henry Tudor in 1485). There was an increase in wealth during this period and subsequently trade flourished across the continent. It was due to this trade that new techniques of timber frame construction began appearing from Europe. 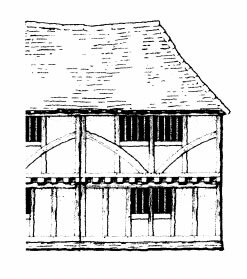 During the twelfth century timber framed buildings became more sophisticated and mortise and tenon joints became an established practice. Instead of being buried in the ground, posts were now jointed into a soleplate that went around the building just above ground level. This advance in jointing methods required not only better tools, but also greater skills. 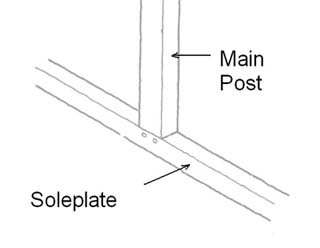 Framing techniques, which appear to have developed on a trial and error basis, quickly improved during this period with crown posts, diagonal braces and tie beams being introduced, leading to quite sophisticated designs. Timber framed buildings were evolving into intricate structures comprising many pieces of timber and, generally, the style of these buildings reflected the area where they were being built. The country was divided roughly into two main zones or regions with the ‘lowland zone’ comprising the South and East and the ‘highland zone’ comprising Wales, the North, the Midlands and the South West. Although there were obviously areas of overlap, it is generally recognized that aisled buildings with crown-post roofs were customary in the lowland zone, whereas Cruck framed buildings were prevalent in the highland zone. The most famous type of timber-framed house in lowland areas is the ‘Wealden House’ and they were widespread in the fifteenth century, reflecting the agricultural prosperity of the area and the influence of London. It was most common in the Weald but widely distributed elsewhere in the south-east and found as far afield as East Anglia and Somerset. It basically comprised a central hall; with the two-storeyed ends of the house both jettied out laterally. Jetties were an architectural symbol of status and an integral part of the Wealden design. The property was covered by a hipped roof, which gave the impression that the hall was recessed. Within the basic type of Wealden House there were many variations of detail. The earlier ones, which evolved before 1400, had widely-spaced timbers, large arch braces that supported the eaves wallplate over the hall. 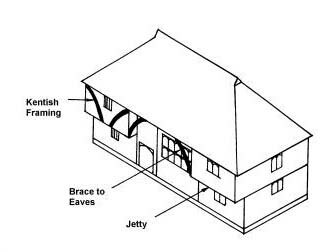 And prominent, symmetrical braces which were known as Kentish framing, as shown in the adjacent sketches. The timber-framed buildings, which are a characteristic feature of many parts of the English countryside and of our historic towns are all very individual and would have been crafted, for their owners, from the trees growing nearby. These unique properties are often described, as ‘half-timber’ but there are differing opinions as to how that term arose. It may come from the practice of halving the trees for their timber or from the half-timber and half-plaster construction of the external walls. In half-timbered buildings the walls were generally filled in between the structural timbers with either brick or wattle-and-daub. Timber-framed buildings are also known as ‘black and white’ and the term refers to the layers of black and white paint, which are applied to timbers and panels respectively, although they were not originally black and white but rather, the beams would have been the natural colour of the oak and the infill panels the colour of the local soil, which was often mixed with ox blood and lime. A few can still be seen today, in this original condition. Timber was the primary material in the construction of small medieval buildings and the timber used was almost invariably local-grown oak. Oak-framed houses have been around for centuries and are very durable structures. There is no doubt about the longevity of oak-framed buildings as the earliest surviving ones date from the thirteenth century. Creating an oak-framed building, from trees, required skilled carpenters who had served a long apprenticeship in order to learn the skills of their craft. The skills were passed down through the generations and it was this great craft tradition that created the unique character of each building. Unfortunately this great craft tradition came to rather an abrupt end in the early nineteenth century. Thankfully there has been a resurgence in recent times of traditionally constructed green oak-framed buildings. They are extremely environmentally friendly and in combination with modern materials they make a very energy efficient home.